I’ve used Yves Rocher, French natural cosmetics, habitually for a while since I came to Canada. Their cosmetics are made from botanical ingredients, so the aroma is so great! I especially love their body lotion. The prices are reasonable, and you can always get some pretty gift when you order. Although they say “natural cosmetics”, they still use preservative such as methyl paraben and sorbic acid. Well, maybe it’s no choice as long as they are a commercial production. When I got back to Japan last time, I tried a handmade lotion my mom made. It was amazingly good and improved my skin condition and felt so velvety. It requires simple ingredients…. means you can get a natural lotion at a reasonable price without any preservatives. I was about to try to make it in Poland, but I couldn’t find all ingredients there. I finally got things to make it (photo 1)! They are actually for two kinds of lotions. The one my mom told me was Aloe Vera lotion. 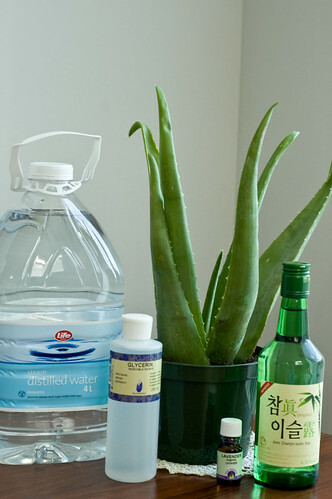 You can cut Aloe Vera, and immersed it into Sho-Chu (Japanese distilled alcohol-around 20% alcohol by volume). After a several days, put glycerin into it, and done! If your skin is sensitive to alcohol, you can dilute it with distilled water. Aloe Vera has a moisturizing effect for your skin – hmmm it’s good for my dehydrated skin in Calgary. I am also planning to make an alcohol free lotion for the face pack. The ingredients for it is pure essential oil (lavender), distilled water, and glycerin. Isn’t it so simple? Apparently I can make green tea lotion or chamomile lotion with these ingredients – I’m getting excited to make them! Well, but make sure you don’t have any allergy for handmade lotions before you use. 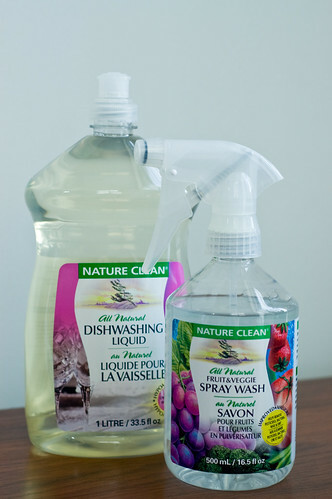 Next photo is also something about “natural”, all natural dish washing (left one) and all natural fruits and vegetable spray wash (right one). As you know, normal dish washing soap on sale usually includes surface active agent which is really poison for human body. Although we have a huge Canadian size dish washer, we still need hand wash for some pretty tea cups. I love having an all natural dish washing soap to protect my hands…. The spray wash, I actually found in Panda’s dad’s house in Poland. As I found out he is a little bit crazy about cleanliness, he brings this from Canada to Poland. You can cutely wash off residual agricultural chemicals and wax from veggies and fruits with it. The third photos are my perfumes. I’ve loved to use “L’EAU D’ISSEY” by ISSEY MIYAKE since I was a university student (center in this photo). 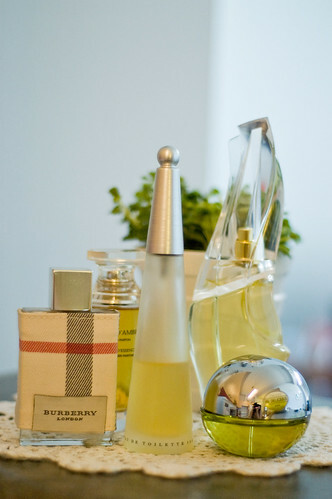 Although I have had chances to get some perfumes as a gift, L’EAU D’ISSEY is my most favorite perfume ever – fresh watery aroma like you are in a forest in spring time. “BE DELICIOUS” by DKNY, however, changed my mind! One of Panda’s colleagues in Poland attracted me with this fragrance. I bought it at a good deal at a DUTY FREE shop on the way back to Canada 🙂 The special travel edition is two of 30ml bottles, while you can get a 50ml bottle usually for that price. Isn’t it a nice deal? I love the moment of spraying the perfume on me before I leave home. It’s one of the happiest times for all girls, isn’t it? This entry was posted on Saturday, July 11th, 2009 at 14:42	and is filed under Canada, Fashion. You can follow any responses to this entry through the RSS 2.0 feed. You can leave a response, or trackback from your own site. 私もずーっとISSEY MIYAKEのL’EAU D’ISSEY（ロードゥイッセイ）一筋の人だよぉ〜！！　でも、実は香水好きで浮気性だから、どうしても他のも試したくなって買うので、ほんとは一筋じゃないなー。。。　でも、L’EAU D’ISSEYは戻るよね！!